All campers must register at the office when arriving and leaving. All reservation fees must be paid within two weeks of the arrival date printed on your reservation confirmation, whether you are on site or not. If you are not coming for the season and plan to sub-rent your site, the reservation fees must still be paid within the two week deadline of your reservation confirmation. Only one RV and one vehicle permitted per site. Due to County and City Zoning Codes we cannot allow you to keep your second RV on your site. If you have a truck camper shell on your truck, the camper shell must be removed and placed into storage. Class C campers that are used for travel must also be placed into storage. RV sites are for 2 people only. Each additional person is considered a guest and must be approved by the office. Absolutely no disorderly conduct, intoxication, fireworks, explosives, firearms, or illegal drugs will be tolerated in the park. Any conduct deemed to be detrimental to the peace and tranquility of the guests of Okeechobee Landings will not be tolerated. Offenders may be expelled. Space around and under RV shall be kept neat and free from rubbish, trash, and other items. Garbage and refuse shall be promptly taken to the resort dumpster by the guest. Quiet hours are 11 p.m. to 8 a.m. Speed limit is 10 M.P.H or as posted. No bicycles, skateboards, or roller skates allowed on sidewalks, shuffleboard courts, pool area, or in any buildings. Smoking is prohibited by Florida law in the office, clubhouse, laundry, and/or restrooms, or inside any other campground facilities. Please dispose properly of cigarette butts. Mini washers and mini dryers only are permitted, as long as they cannot be seen from the street. These are for personal use only. Clotheslines tied to or between trees, electrical poles, or any other campground property, are not permitted. Clotheslines may be tied under your own awning only. Drying racks and umbrella style racks are permitted on your site. Shoes and shirt are required in offices and clubhouse. Rubber sole bath shoes should be worn in restrooms. Washing of RV and vehicles is allowed on the park. However, those who abuse of this will be charged $8.00 each time. No oil changes are permitted at sites. No RV or vehicle repairs and no oil spills allowed on site. A cargo/storage trailer is allowed on your site only under these guidelines. The trailer must be 18 ft or shorter. It must fit behind your RV, it cannot be in front of the RV or on either side of the RV. Also, if you already have a shed on your RV site, you cannot store your trailer at your site. So, if your trailer is longer than 18 ft, or cannot fit behind your RV, or you already have a shed on your RV site then you must store your trailer in the storage lot. The park storage lot will be on a first come basis. You must register your trailer in the office before placing it in storage. Once the storage lot in the back is full, you will have to store your trailer off site at a storage lot in town. Internet and phone services are accessible in the clubhouse as a convenience only. Too many Internet users will slow down the internet speed. We accept any type of RV, but it must be clean and in good condition. 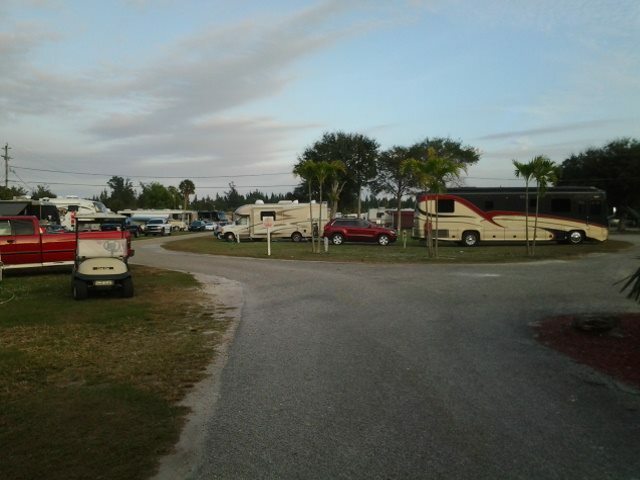 Okeechobee Landings reserves the right to refuse, without reimbursement, any RV deemed in poor condition. No one under the age of sixteen is permitted to operate any motorized vehicle anywhere on the premises of the park property. This includes but is not limited to gas powered, electric powered, solar powered, golf carts, go-carts, motor bikes, scooters, riding lawn mowers, etc…. If it has a motor it is included! There is a fee of $5.00 per day for each guests (over 14 years old) who stay for the night. You need to register at the office. All campers who will not respect this rule, will be requested to pay a fee of $200.00. Campers must accompany their guests to the pool or any other facilities or events. Sewer Connection: The sewer line from the sewer must be properly sealed for Health Department requirements. No water is allowed to leak onto your site from waste system. Electric Connection: It is a violation to plug into 2 sites or to plug into a site that is not yours. If you are overloading breaker, please notify office. Turn breaker off before plugging in and unplugging. Check prongs in your connector cord, as loose prongs can damage our box and your connector. Water Hook-ups: Anyone knocking down a water hook-up will be charged $75. Current record of rabies shot must be presented if requested by management. While we have no size restrictions on pets, aggressive or attack breeds (German Shepherds, Chows, Dobermans, Pit Bulls, Rottweilers, etc.) are not welcome. Two pet maximum per unit. All dogs are to be kept quiet and on a short leash at all times everywhere in the park. Do not tie dogs to trees or where they can damage trees or other foliage. Please clean up after your pet. Removal of pet’s fallout is the pet owner’s responsibility. Pets are not allowed in the pool area, bathhouses, clubhouse, or in the any of the other buildings. Please walk your pet away from RV spaces. Pets may not be tied outside RV between the hours of 10:00PM and 6:00AM. Barking, noisy, or vicious dogs are considered offensive and will not be tolerated. Park management reserves right to ask that the dog be removed from the park. Restrooms are cleaned regularly, please clean up after yourself. Do not dispose of pet feces in the bathrooms’ trashcans. Please use the garbage dumpsters or your own garbage can. Pool is open from dawn until dusk, weather permitting. No glass containers, running, pushing, diving or pets allowed in pool area. No lifeguard on duty, swimming at your own risk. No wet swimsuits in clubhouse or offices. All garbage must be wrapped in plastic bags. Bags should be taken to trash dumpsters daily. Garbage only – no appliances, furniture, construction debris, etc. Recycling is mandatory. Dispose of aluminum cans in the blue recycle bin. Cardboard boxes must be taken apart before disposal in the recycling dumpster. No trash in any recycling containers. Mail (including packages) is to be collected after 1PM only. Mail will be sorted using lot numbers. If your incoming mail does not have your lot number, it will be left in an unsorted pile. Okeechobee Landings RV Resort assumes no responsibility for any delivered mail. All reservations require a deposit. All remaining fees must be paid at the time of arrival. If you cancel BEFORE September 1st 2019, for your 2019-2020 reservation, you will be refunded 85% of your initial deposit. If you cancel ON OR AFTER September 1st 2019, no refunds will be given under any circumstance. No refunds will be given, under any circumstance, in the event that you must depart after the beginning of your stay. No refunds will be given if you are expelled from the park. Reservations are made on a back-to-back basis; extensions, if available, may require a change of site. Management reserves the right to amend or revise the Rules and Regulations. The owners and management assume no responsibility for accidents, injuries, or loss from any cause. Care and common sense should be exercised by guests at all times. All renters agree to read and comply with all the above rules. Violating the rules will cause you to be expelled from the campground without refund. We reserve the right to refuse service to anyone. Tous les campeurs doivent s’enregistrer à l’office à l’arrivée et au départ. Tous les frais de réservation doivent être payés dans les deux semaines suivant la date d’arrivée inscrite sur votre confirmation de réservation, que vous soyez sur place ou non. Si vous ne venez pas pour la saison et prévoyez de sous-louer votre site, les frais de réservation doivent quand-même être payés dans le délai de deux semaines de cette date d’arrivée de votre confirmation de réservation. Seulement un VR et une voiture sont autorisés par site. Selon les codes de zonage du comté et de la ville, nous ne pouvons pas vous permettre de garder un deuxième VR sur votre terrain. De plus, si vous avez une <> sur votre camion, celle-ci doit être enlevée et placée dans le storage. De même que les campeurs (Classe C) qui sont utilisés pour le voyagement, ils doivent également être placés dans le storage, si vous avez déjà un VR en place sur votre terrain. Chaque site est pour 2 personnes seulement. Chaque personne supplémentaire est considérée comme un invité et doit être approuvé par l’office. Absolument aucune mauvaise conduite ne sera tolérée. Intoxication, drogues illégales, feux d’artifices, explosifs, et armes à feu sont strictement interdit au camping. Toute conduite jugée inappropriée ou dérangeant la paix et la tranquilité des autres campeurs ne sera pas tolérée. Les contrevenants pourront être expulsés. L’espace sous et autour de votre VR doit être maintenue propre et sans débris ou déchets. Les ordures et les déchets doivent être apportés rapidement au conteneur à déchets. Les heures de tranquillité sont de 11p.m à 8a.m. La limite de vitesse est de 10M.P.H ou tel qu’indiqué. Les vélos, planches à roulettes, et patins à roulettes ne sont pas autorisés sur les trottoirs, les terrains de shuffleboard, autour de la piscine, ou dans les bâtiments. Par la loi de la Floride, il est strictement interdit de fumer dans l’office, le clubhouse, les buanderies, les salles de bain, et toutes autres bâtiments du camping. SVP, veuillez disposer correctement de vos mégots de cigarettes. Les mini laveuses et mini sécheuses seulement sont permises pour usage personnel et ne doivent pas être visibles de la rue. Les cordes à linge attachées entre les arbres, les poteaux électriques, ou tout autres installations du camping ne sont pas permises. Les cordes à linge peuvent être attachées sous votre propre auvent seulement. Les séchoirs à linge et les séchoirs de style parapluie sont permis. Chaussures et chandails doivent être portés dans l’office et le clubhouse. Des sandales de caoutchouc doivent être portés dans les salles de bain. Le lavage de VR et véhicule est permis sur le parc. Cependant, ceux qui abuseront devront payer 8.00$ par lavage. Les changements d’huile ainsi que les réparations de VR et véhicules ne sont pas autorisés sur les sites. Une remorque cargo/entreposage (trailer) est autorisée sur votre site uniquement en vertu de ce qui suit : La remorque doit être de 18 pieds ou moins. Elle doit etre placée derrière votre VR, elle ne peut pas être en face du VR ou de chaque côté du VR. 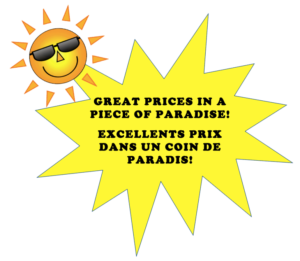 De plus, si vous avez déjà une remise sur votre site, vous ne pouvez pas garder votre remorque sur votre site. Donc, si votre remorque est plus longue que 18 pieds, ou n’a pas l’espace nécessaire derrière votre VR, ou vous avez déjà une remise sur votre site, alors vous devez placer votre remorque dans le storage à l’arrière. Le storage à l’arrière sera sur une base de premier arrivé, premier servi. Vous devez aussi enregistrer votre remorque à l’office avant de la placer dans le storage. Une fois que l’espace de storage sera plein, vous devrez storer votre remorque hors-site à un espace de storage à l’extérieur du parc. Le service internet est accessible au club-house pour dépannage seulement. Trop d’utilisateurs d’Internet ralentira la vitesse de l’Internet. Nous acceptons tout équipement de camping, mais les équipements doivent être en bon état et très propres. Okeechobee Landings se réserve le droit de refuser tout campeur, sans remboursement, si cela n’est pas le cas. Personne de moins de 16 ans n’est autorisé à opérer un vehicule motorisé n’importe où dans le parc. Cela comprend, mais n’est pas limité aux vehicules à gaz, vehicules electriques, voiturettes de golf, karts, motos, scooters, tondeuse à gazon, etc. Tout ce qui a un moteur est inclus. Les campeurs doivent accompagner leurs invités à la piscine ou toutes autres installations ou évènements. Connexion d’égout: La conduite d’égout doit être correctement scellée tel que requis par le Département de la Santé. L’eau de votre système de vidange ne doit pas couler sur votre site. Connexion d’électricité: Il est strictement interdit de se brancher sur 2 sites ou sur un site qui n’est pas le vôtre. Si votre disjoncteur (“breaker”) surcharge, veuillez aviser l’office. Mettre le disjoncteur à “off” avant de vous brancher et débrancher. Veuillez toujours vérifier les embouts sur votre connecteur car des embouts lousse peuvent endommager notre boite électrique et votre connecteur. Connexion d’eau: Si vous brisez le poteau de connexion d’eau, des frais de 75$ vous seront chargés. Documentation récente de vaccination doit être pŕesenteé si demandé par la direction. Bien que nous n’avons pas de restrictions de taille sur les animaux, les chiens de races agressives (Bergers allemands, Chows, Dobermann, Pitbull, Rottweilers, etc.) ne sont pas les bienvenus. Maximum deux animaux de compagnie par unité. Tous les chiens doivent être tenus calmes et sur une laisse courte en tout temps, partout dans le parc. Ne pas attacher les chiens aux arbres ni aux endroits où ils peuvent endommager les arbres et autres végétations. SVP, veuillez ramasser les excréments de vos animaux, il en est de votre responsabilité. Les animaux ne sont pas permis autour de la piscine, dans les salles de bain, au clubhouse, ou tout autre bâtiments. SVP, lorsque vous promenez vos chiens, ne les laissez pas aller sur les terrains des autres campeurs. Les animaux ne peuvent pas être attachés à l’extérieur de votre VR entre 10PM et 6AM. Les chiens qui jappent, sont bruyants, ou sont malins sont considérés offensifs et ne seront pas tolérés. Okeechobee Landings se réserve le droit de demander que ces chiens soient retirés du parc. Il est strictement interdit de fumer dans les salles de bain. Les salles de bain sont nettoyées régulièrement, alors svp, veuillez aider à les garder propre en vous ramassant. Ne pas jeter les excréments d’animaux dans les poubelles des salles de bain. Svp, utiliser les gros conteneurs à déchets ou votre propre poubelle. La piscine est ouverte de l’aube au crépuscule, si la température le permet. Les enfants de moins de 14 ans doivent être accompagnés par un adulte. Pas de récipients en verre, de course, de bousculade, de plongée, ou d’animaux autour de la piscine. Il n’y a pas de sauveteur présent. Baignade à vos propres risques. Pas de maillots de bain mouillés dans le clubhouse ou à l’office. Tous les déchets doivent être emballés dans des sacs en plastique. Les sacs doivent être apportés au conteneur à déchets à tous les jours. Déchets seulement – pas d’appareils ménagés, meubles, débris de construction, etc. Le recyclage est obligatoire. Mettre les cannettes d’aluminium dans les bacs prévus à cet effet, pres des conteneurs a vidange. Les boîtes en carton doivent être défaites avant de les jeter dans le conteneur à recyclage. Pas de déchets dans les conteneurs de recyclage. Le courrier, incluant les colis, peut être recueilli après 1PM seulement. Le courrier sera trié par numéro de lot. Si votre numéro de lot n’est pas indiqué, votre courrier sera laissé dans une pile non triée. Okeechobee Landings n’assume aucune responsabilité pour tout courrier livré au camping. Toutes les réservations exigent un dépôt. Tous les frais restants doivent être payés à l’arrivée. Si vous annulez votre reservation AVANT LE 1er Septembre 2019, pour votre reservation 2019-2020, 85% de votre dépôt initial vous sera remboursé. Si vous annulez votre réservation LE ou APRES le 1er Septembre 2019, aucun remboursement ne sera accordé pour aucune considération. Aucun remboursement ne sera accordé, sans exceptions, dans le cas où vous devez partir après le début de votre séjour. Aucun remboursement ne sera accordé si vous êtes expulsés du parc. Tout prolongement à votre réservation initiale, si disponible, peut nécessiter un changement de site. La direction se réserve le droit de modifier ou de reviser les règlements. Okeechobee Landings n’assument aucune responsabilité pour les accidents, les blessures, ou la perte de n’importe quelle nature. La prudence et bon sens doivent être observés par tous les campeurs en tout temps. Tous les campeurs s’engagent à lire et respecter touts les règlements. Toute personne qui enfreint les règlements peut être expulsé du camping sans remboursement. Okeechobee Landings se réserve le droit de refuser le service à qui que ce soit.